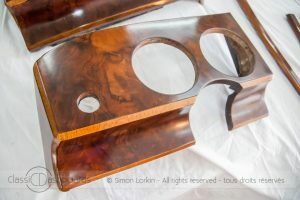 By British craftsman dashboard restorer Simon Lorkin, based in France. 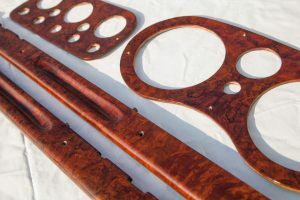 At Classic Dashboards traditional craftsmanship skills and expertise are used to bring out the beauty of the interior of classic car interiors by restoring the original dashboard and interior trim, not by replacing with new items. Simon Lorkin understands that you have invested a lot of time, effort and money in the restoration of your classic car. He knows that the dashboard and interior trim are the ‘final touch’ and make a big difference to the appearance and how you feel about your precious car. He also understands that numerous classic car owners aren’t looking to simply throw away the old damaged dashboard to replace with an inferior quality modern dashboard, which isn’t quite the colour hoped for or simply doesn’t last long as it’s made from cheaper products for the mass market. 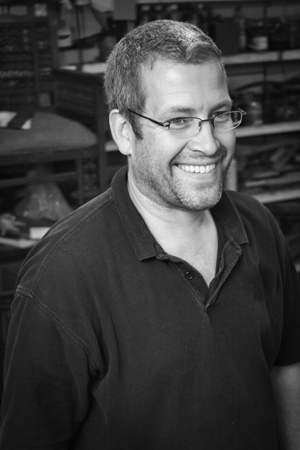 With over 30 years experience that he now has, his expertise is respected in the world of classic cars and his clients call on him because of his commitment to the quality of his work and his relationships with his clients. Many wooden interiors have deteriorated to the point that the finish has perished and needs repairing. The process begins with the removal of the old finish. Depending on the original finish this can be and easy part of the project or it can be a time consuming endeavour. It’s often impossible to know until I work on the items. Old finishes aren’t sanded off as that risks damaging the delicate layer of veneer underneath. Products are used to gently ‘eat’ away the old finish. Sometimes the veneer is ‘blown’ in the middle or is coming loose around the edges. This can sometimes be solved by my restoration processes allowing the original veneer to be saved thereby keeping its original authenticity. Alternatively, if the veneer is too damaged or rotten, the entire veneer can be replaced matching the grain as best as possible. When re-veneering dashboards I use my antique restoration skills and experience to bring out the warm honey colours that are often associated with well restored classic cars. 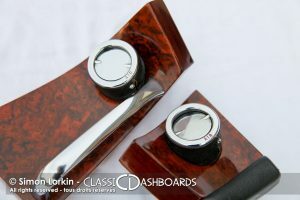 At Classic Dashboards I use water-based lacquer that gives a natural looking finish to your dashboards and wood trim. It is not my style to produce the thick and glassy finish that appears in new cars. 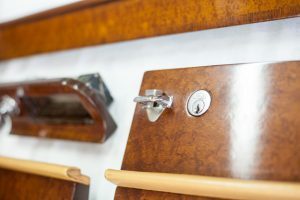 My style is to restore the beauty in the car’s interior woodwork and achieve this by using a water-based UV Safe lacquer in fine coats so show off the beauty of the woodwork. This is apply in up to 20 coat micron thin coats and is cut-back by hand in between creating a finish so fine it feels like you’re touching the real wood. I don’t have a set ‘colour’. When a project arrives I discuss with the client their hopes for the finished colour depending on the colour of their upholstery and car colour. I adjust my methods to incorporate the clients ideas to achieve a lighter, mid or darker tone depending on the woodwork itself and what is physically achievable. Here’s a series of photos showing the restoration of a Triumph TR6 dashboard. After the removal of the old finish and veneer the choice of new veneer is stuck to the base wood. The holes for the instruments are trimmed. As you can see the veneer for a dashboard is always taken from a single sheet of veneer so that grain ‘fits’ over the glove-box door. I always also re-veneer the inside of glove box doors so that when they are open it matches and looks well restored too. If the style of the dashboard has the sides of the instrument holes on show these are always delicately painted in a dark brown to match and this ensures a smart ‘edge’. When lacquering a dashboard I always also lacquer all the edges and behind the dashboard to ensure that no humidity can enter from behind.